Mindless Musings From the Maxx: Buy One Car & Get One Car For $1.00! Buy One Car & Get One Car For $1.00! Uncle Frank and I discovered a lil' Suzuki dealership down in Florida that was going out of business and made 'em an offer that they couldn't refuse on an entire fleet of Brand New 2008 Suzuki Forenzas and Renos. Much to our surprise, they accepted the offer and now we're extending this once-in-a-lifetime offer to YOU! 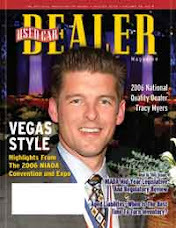 Buy one of our BRAND NEW 2008 Suzuki Forenzas and/or Renos and...(are you ready)...GET ANOTHER CAR FOR $1.00! That's right! 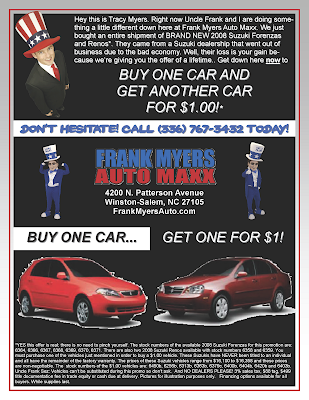 It's the best 2 for 1 deal you've ever seen so here's what you need to do next: print out the certificate above, get on down to Frank Myers Auto Maxx and drive home both of your new vehicles. Better hurry cause this won't last long.